Our brief from our client POBL was for a modern and iconic flagship city centre development for the ‘over 55’s’ affordable market. The site which is located to the north end of Commercial Street in Newport has been heavily affected by a lack of investment over the past 25 years. This site was created through a series of land purchases with the vision that it would provide the catalyst for the wider regeneration of the Lower Commercial Street area. Funding was secured through the Welsh Assembly Vibrant and Viable Places initiative which is aimed at creating new homes and businesses at key city centre sites. 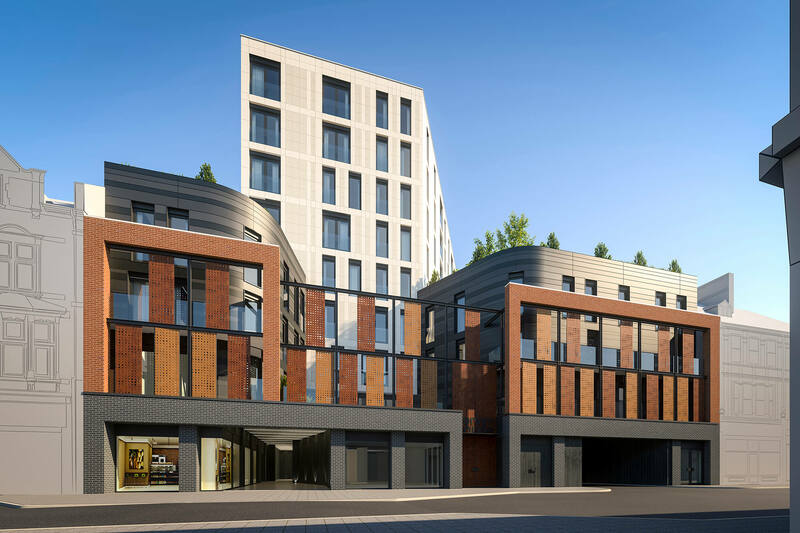 The scheme provides continuity at the street level through the use of a modern palette of materials which compliments the existing street scene. A retail unit, car park and walkway link through to the rear multi storey car park is provided on the ground floor. 3No. apartment blocks containing 38 apartments are created behind the feature screens at the 1st and 2nd floors, with the rear 9 storey block finished in a high-quality limestone. 3No. private external landscaped amenity areas are created within the site including the roof top allotment garden.